Apple has told one developer that it has 'no plans' to port Siri to older Apple devices like the iPhone 4. 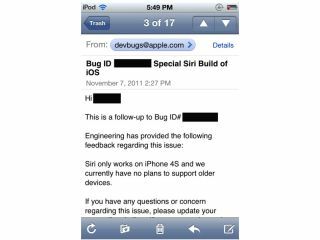 The fruit-flavoured company sent an email response to an anonymous developer after he or she emailed the bug report service to suggest offering a paid upgrade to those using older iOS devices than the iPhone 4S. The email read, "Siri only works on iPhone 4S and we currently have no plans to support older devices." 'No plans' doesn't mean there will never be plans to bring the voice-controlled assistant to other iOS devices, but it certainly puts the recurring rumours of an official Siri app for iPhone 4 to bed for now. If you're desperate to chat with Siri and don't mind doing so a little less officially, you can jailbreak your older iOS handset and get Siri up and running that way. But it's probably more effort than its worth especially as you risk killing your iPhone and voiding any kind of warranty.